Ecological Civilization: Could China Become a Model for Saving the Earth? 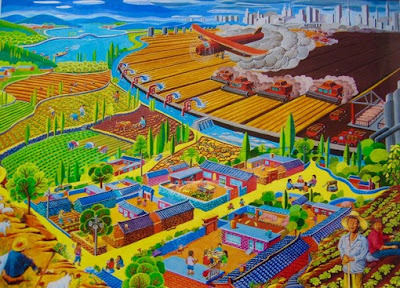 Peasant and industrialized agriculture facing each other — in China. Painting gifted to me by Ye Jingzhong, China Agricultural University, Beijing, China. Photo: E.G. Vallianatos. Industrialized agriculture is threatening humanity with catastrophe. It feeds global warming and dissolves societies. In addition, its pesticides contaminate and poison drinking water and food. I reached this conclusion from working for the US Environmental Protection Agency for twenty-five years. I summarized my experience in my 2014 book, Poison Spring: The Secret History of Pollution and the EPA. This essay reflects my knowledge from that experience. The industrialization of agriculture did massive damage to rural America, turning most of that beautiful land into medieval plantations. Instead of millions of small family farmers, we now have a few thousand large corporate farmers in charge of rural America and the growing of most food. Democracy and human and environmental health suffered a severe blow. Money and power triumphed. Like many countries, China is trying to catch up with the agricultural superpower illusion of America. Yes, America produces huge amounts of food, but at unsustainable and catastrophic costs and consequences. There are non-toxic alternatives to coaxing more from an acre of land. In the United States, the alternative to chemical farming has the name of “organic” agriculture. In the European Union, the alternative is “biological” agriculture. These alternatives are sophisticated modifications of traditional agriculture. They produce and sell food without using pesticides, synthetic fertilizers, genetic engineering, sludge, and radiation. But like industrialized farming, the organic-biological alternatives ignore the size of farms, the plight of farm workers, the kind and size of farm machinery, the use of petroleum and petroleum products like plastics. Petroleum fuels industrialized societies. Their agriculture, transportation, energy and defense industries are largely depended on petroleum. However, petroleum is a major global warming fuel. China has a growing sector of industrialized agriculture. China has also more than 200 million peasants practicing traditional farming. Caught between these two gigantic forces, The Chinese government is campaigning on behalf of environmental protection primarily as an antidote to the ecocidal and destabilizing effects of environmental pollution. I have had the opportunity of visiting China twice. The Institute for Postmodern Development of China made that possible. Since 2005, this non-profit organization based in Claremont, California, has been the ecological link between China and America. Indeed, the first time I heard the term “ecological civilization” was in Claremont where I have been living since 2008. I immediately smiled and connected ecological civilization to fantasy. The idea, of course, is not entirely utopian. First of all, it is beautiful. It brings to mind heaven on Earth: flourishing villages and towns, peasants working the land without outsiders oppressing them or oppressing each other or polluting the natural world; flowers, monarch butterflies, honeybees, singing birds, sheep and lambs, fig trees, flowering lemon and almond trees, creeks and rivers running through the land, olive groves, grapevines and god Dionysos and his maenad followers indulging in a frenzy of dance and music. However, Zhihe Wang and Meijun Fan, who direct the Institute for Postmodern Development of China, probably have other dreams for ecological civilization. They grew up in the China of Mao Zedong. They experienced hunger and witnessed the destruction of traditional Chinese culture. They are both trained in academic philosophy. They know China and the West. They may see ecological civilization as an emerging new global philosophy. Either humans will learn how to live in harmony with the natural world or they will become extinct. Perhaps ecological civilization is a convenient expression for the end of war and a beginning of something better for themselves and China. It may be no more than a slogan or deep belief in a better world. I joined the discussion about ecological civilization during some of the conferences they sponsored in Claremont. That gave me a chance to talk to Chinese scholars. Such theoretical perspectives enriched my limited observations in rural China. Chinese peasants told me they love the land they rent from the state. And Chinese agronomists who study peasant farming told me they would love to see a better future for peasant farming. Nevertheless, China is striving to “modernize” its peasant agriculture. Chinese scientists have been training in America for decades. The Chinese government is funding these scientists to expand the scope of industrialized farming in China. Both the government and the American-trained scientists overlook the fact that peasants are raising most of China’s food. Industrialized farmers in China are converting peasant land to large factory farms. Such a policy is bound to spark clashes between peasants and large industrialized farmers supported by the government. This looming tragedy is a telling example of how difficult it is to maintain ancient ecological traditions in an age of worldwide ecocide and rapacious ambitions and governance. In contrast to the hegemonic American agribusiness and the equally hegemonic if misguided developing Chinese agribusiness, Chinese peasant farming opens an exciting vista of ecological and political insights for a strategy of an agriculture that is largely benign to the natural world, just to those working the land, and healthy to all eating the food peasants grow. Industrialized agribusiness, be that of the American or Chinese variety, is against ecological civilization. Organic / biological farming and peasant agriculture open the doors to ecological civilization – just a little. They give us but a glimpse of what the future could become. The first system – agribusiness — is a grab for power; the second is a spark from millennial traditions of wisdom and practice in the raising of food without wounding the land. There’s also the best of modern science coming under the name of agroecology: the latest findings in agricultural ecology, that could and would complement and enrich peasant practices. China would do its culture a favor if it turns all its efforts in repairing and strengthening its peasant farming, abandoning its agribusiness as an error. Such a policy shift would tell the world China is serious about ecological civilization – and fighting global warming. At that moment, China might become a model for saving the Earth.